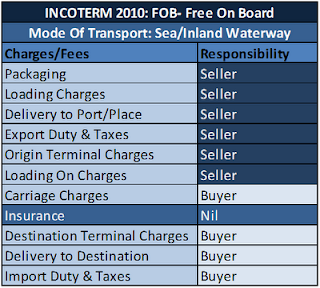 The FOB Incoterms ensure that the sellers load themselves the goods on board the vessel nominated by the buyer. 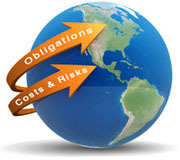 Cost and risk are divided when the goods are actually on board of the vessel (this rule is new!). The seller must clear the goods for export. 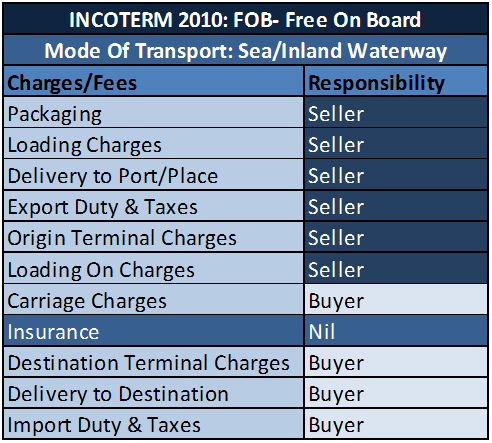 The term is applicable for maritime and inland waterway transport only but NOT for multimodal sea transport in containers (see Incoterms 2010, ICC publication 715). 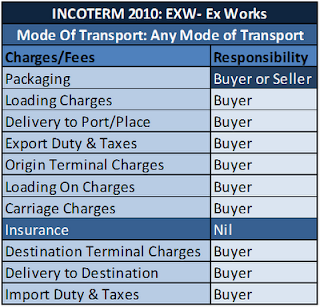 The buyer must instruct the seller the details of the vessel and the port where the goods are to be loaded, and there is no reference to, or provision for, the use of a carrier or forwarder. 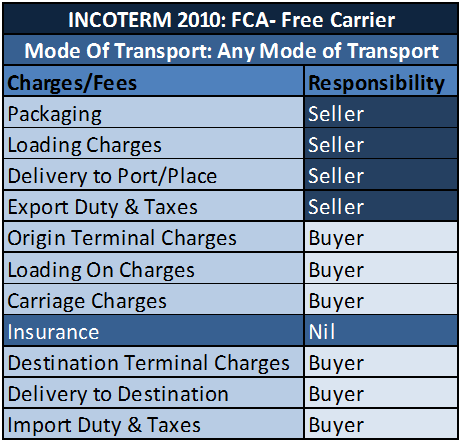 This term has been greatly misused over the last three decades ever since Incoterms 1980 explained that FCA should be used for container shipments. 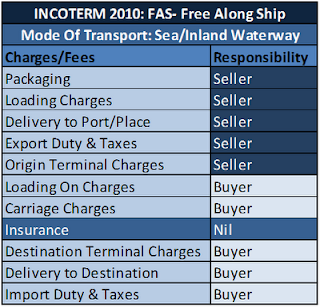 Under this this Incoterms, the seller must place the goods alongside the ship at the named port. The seller must clear the goods for export. 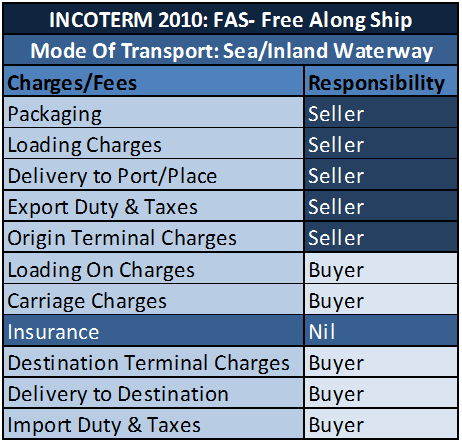 Suitable only for maritime transport but NOT for multimodal sea transport in containers (see Incoterms 2010, ICC publication 715). 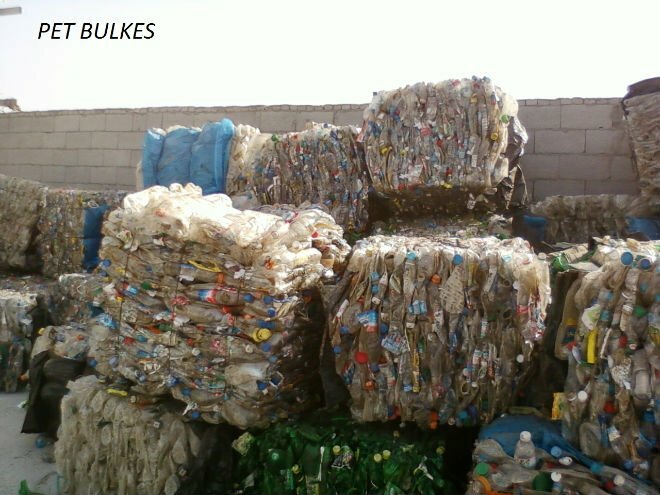 This term is typically used for heavy-lift or bulk cargo. 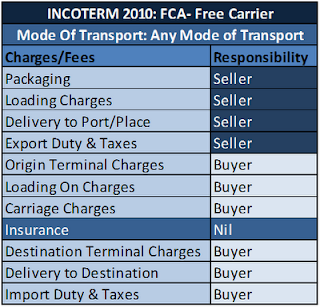 Using FCA Incoterm simply means that the seller's obligation is to hand over the goods, cleared for export, into the charge of the carrier named by the buyer at the named place or point. If no precise point is indicated by the buyer, the seller may choose within the place or range stipulated where the carrier shall take the goods into his charge. When the seller's assistance is required in making the contract with the carrier the seller may act at the buyers risk and expense. This term can be used across all modes of transport. 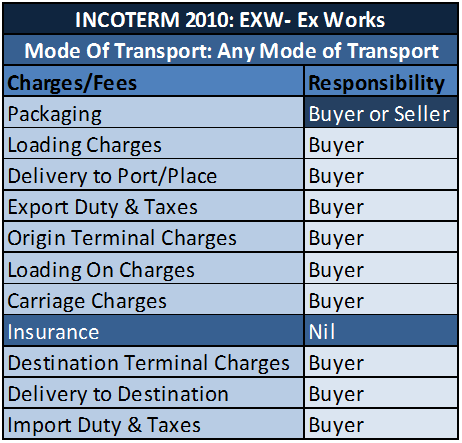 Accepting EXW means that the buyer bears all costs and risks involved in taking the goods from the seller's premises to the desired destination. The seller's obligation is to make the goods available at his premises (works, factory, and warehouse). This term represents minimum obligation for the seller. This term can be used across all modes of transport. Price range : NGN12,000-15,000/MT delivered to Lagos. Experts at a United Nations-backed forum have stressed that low-income countries need help to enable them to benefit from the added value derived from the agricultural produce and natural resources that are the mainstays of many of their economies. The suggestion was made by speakers at the third Global Commodities Forum, hosted by the UN Conference on Trade and Development (UNCTAD), which took place Monday in Geneva, Switzerland, according to a UN release. They said that despite a decade’s worth of rising commodity prices, the so-called commodity dependent developing countries (CDDCs) have been unable to benefit from the higher prices, diversify their economies and raise living standards. “There has been ongoing debate on diversification for CDDCs. From 2002 to 2010, the number of CDDCs increased from 85 to 91,” said the UNCTAD Secretary-General, Supachai Panitchpakdi, in his address to the forum. “While we have been trying to find ways to advise countries to be less commodity-dependent, CDDCs have actually become more heavily dependent on commodities exports, and the number of countries that are dependent has increased,” he said. There is need to use the benefits that come from higher prices for “long-term development purposes,” Panitchpakdi said. Royalties and wages earned by developing countries from commodities frequently are only a small portion of the final sales prices of the finished goods made from them. The bulk of the profits accrue overseas, he added. Mr. Supachai said the mining of natural resources in developing countries, for example, often results in “enclave economies” that do not generate broad economic “spill over” benefits for the producer nations. Ways should be found “to spawn wider economic activities” coming from mining, he said, so that more of the upgrading of these natural resources occurs domestically, creating jobs with higher wages. Vice President of the UNCTAD Trade and Development Board, Ibrahim Al-Adoofi, told the meeting that the forum is part of broad efforts to prepare the way for the UNCTAD XIII quadrennial conference to be held in Doha from 21 to 26 April. “New developments in the global economy have exposed the limitations in our current development model,” said Mr. Al-Adoofi. 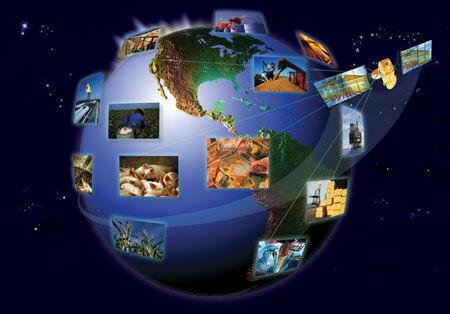 “It is necessary to steer commodities development efforts in new directions,” he added. 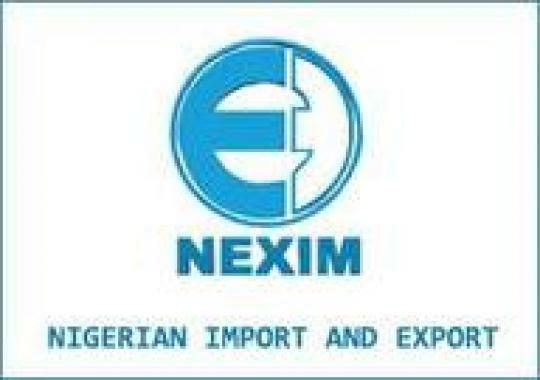 The Nigerian Export Import Bank said on Monday that it would support exporters with a budget of N30bn this year to boost export activities. 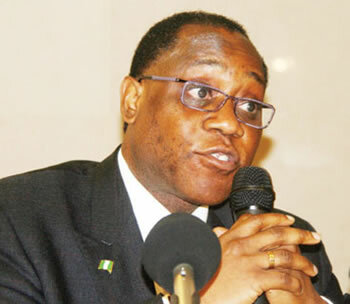 Committee on Banking and Currency to defend its 2012 budget proposals, said that exporters in agriculture, solid minerals and manufacturing sectors would benefit from the N30bn. However, he complained that NEXIM was facing challenges in recovering some old debts dating back to between 10 and 15 years. Orya told the committee that while NEXIM had planned to recover about N1.9bn debts in 2011, it was able to recover only N418m. Orya added, “Low recovery of debt has been the major challenge of NEXIM. “We hope that this year we should be able to do much more better. “Even at that in 2012 we are planning to recover N1.3bn and as soon as we are able to recover that, it will go into our loss and profit account,” he added. Some members of the House urged NEXIM to work harder by justifying the reason the Federal Government set up the bank. The chairman of the committee, Mr. Chukwu Onyereri, called on the bank to step up its loan recovery efforts. On revenue generation, Orya said that the bank projected N3.08bn for this year, including the N1.3bn anticipated debt to be recovered. He also stated that one of the bank’s major stakeholders, the Ministry of Finance Incorporated, would fully pay its share capital this year. The Federal Government is currently working on a new trade policy that will optimally harness Nigeria’s trade potential for job creation , wealth generation and economic transformation. The Minister of Trade and Investment, Mr. Olusegun Aganga, stated this during a meeting with the National Association of Nigerian Traders, in Abuja. Those that attended the meeting with Aganga are the Minister of State for Trade and Investment, Dr. Sam Ortom; Permanent Secretary of the ministry, Mr. Dauda Kigbu; and top executives of NANTS led by its President, Mr. Ken Ukaoha. Aganga noted that the committee, which was set up by the ministry to review the country’s existing trade policies, would soon complete its assignment. The minister added that the Federal Government was committed to providing an enabling environment to boost trade and investment across all sectors of the Nigerian economy. He said, “The Federal Government is ready to come up with policies that will facilitate trade and investment across all sectors of the Nigerian economy. He also said, “I am optimistic that the committee will soon submit a creative, comprehensive, practicable and thought-provoking report that will remove all bottlenecks inhibiting the full actualisation of Nigeria’s trade potential. Speaking on the ministry’s strategy for growing the nation’s industrial sector, Aganga stated that it would concentrate on areas where the country had comparative and competitive advantage, adding that the Federal Government was committed to partnering the Organised Private Sector to increase the productivity of local industries. Speaking during the meeting, the NANTS President, Ukaoha, said that there was an urgent need to review and harmonise Nigeria’s trade policies to enable the country to maximise its abundant human natural resources for rapid economic transformation. Oil Discovery Hinders Africa’s Growth. The Guest Speaker, at a National Lecture: “Nigeria in Transformation,” Mr. Richard Dowden, has described the discovery of oil in Nigeria as a “curse” rather as a blessing a to Nigeria. Dowden, who is currently the Director of Africa Royal Society (ARS), identified “unfairness in the system of resource allocation” as reason for fierce competition. He also listed corruption, poor reputation and flight of human capital as other factors that have worked against the country’s economic prosperity. According to him, “after oil and corruption which are closely linked, I would say that Nigeria’s reputation in the past still puts off investors and tourists”. “What I see here is that perceived or real unfairness in the system of resource allocation has led to fierce competition for success- or just survival. I would say that the competitive, creative spirit this creates is far more powerful than in any other country in the world,” he said. While comparing Nigeria with other countries like Indonesia who shared similar socio economic and political experience, Dowden described as unacceptable, a situation where Nigerian politicians are the highest paid in the world with $1Million Dollars as salary with another $1Million in expenses while the country accounts for over 10 percent of Maternal and child mortality rate as well as 10 percent of the world Children who are out of school. He warned that if the up coming generation of Nigerians are unable to fulfill their potential, the country stand the risks of experiencing mass revolt. He therefore called on government to build strong institutions that would ensure consistency and continuity in governance.